House Democrats have a lot to figure out on their signature issue. Health care carried House Democrats to victory on Election Day. But what now? In interviews this fall with half a dozen senior House Democratic aides, health care lobbyists, and progressive wonks, it became clear the party is only in the nascent stages of figuring out its next steps on health care. The new House Democratic majority knows what it opposes. 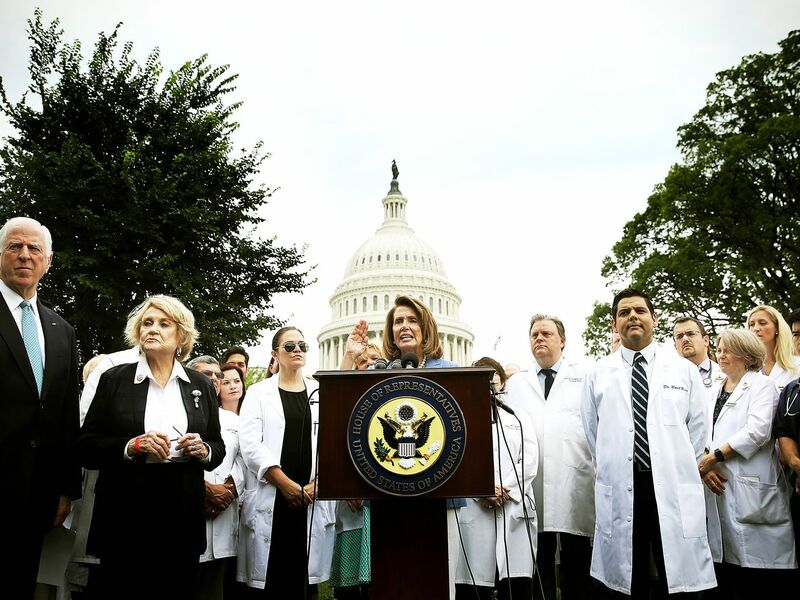 They want to stop any further efforts by Republicans or the Trump administration to roll back and undermine the Affordable Care Act or overhaul Medicaid and Medicare. But Democrats are less certain about an affirmative health care agenda. Most Democrats campaigned on protecting preexisting conditions, but the ACA has already done that. Medicare-for-all is energizing the party’s left wing, but nobody expects a single-payer bill to start moving through the House. Drug prices offer the rare opportunity for bipartisan work with Senate Republicans and the Trump White House, but it is also a difficult problem with few easy policy solutions — certainly not any silver bullet that Democrats could pull out of the box and pass on day one, or even month one, of the next Congress. Winning a House majority to ensure Obamacare’s safety is an important turning point after so many years in which health care hurt Democrats much more than it helped. But the path forward for the party on their signature issue is surprisingly undefined. Democrats do have some ideas, of course. Democratic aides emphasized the various investigations they could launch into Trump’s health department, not only looking into any efforts by the White House to sabotage Obamacare but also focusing on more obscure issues like Medicare payment rates. But wonky oversight inquires probably aren’t the big-ticket item that new Democratic members and their voters are looking for, especially heading into the 2020 presidential election. After campaigning in defense of Obamacare, warning about Republicans rolling back preexisting conditions protections and the Trump administration’s sabotage of the health care law, a bill to stabilize the Obamacare insurance markets would be the obvious first item for the new Democratic majority’s agenda. Several sources pointed to a bill by Democratic Reps. Richard Neal (MA), Frank Pallone (NJ), and Bobby Scott (VA) — who have been serving as the top Democrats on leading health care-related committees — as the likely starting point. The plan is designed to build off Obamacare’s infrastructure to expand federal assistance while reversing the recent Republican efforts to undermine the law. That bill would expand Obamacare’s premium subsidies, both by extending federal assistance to more people in lifting the current eligibility cutoff and by increasing the size of the tax credits people receive. It would also bolster the cost-sharing reduction subsidies that people with lower incomes receive to reduce their out-of-pocket costs, while extending eligibility for those subsidies to people with higher incomes. The Pallone-Neal-Scott bill would reverse the Trump administration’s recent regulations intended to funnel more people to insurance plans that are not required to meet all of Obamacare’s rules for preexisting conditions. It would also pump more money back into enrollment outreach, cut by the Trump administration, and establish a new program to compensate insurers for high-cost patients, with the hope of keeping premiums down. Two things stick out about this bill: It would be the most robust expansion of Obamacare since the law first passed, and it is just narrow enough that, with a few sweeteners for Senate Republicans, it could conceivably have a chance to pass. Democrats are waiting to see how the GOP majority in the upper chamber reacts to losing the House. Senate Republicans and Democrats did come very close to a narrow, bipartisan deal — it wasn’t even as robust as the Pallone-Neal-Scott bill — to stabilize Obamacare in 2017. It fell apart, ostensibly after a tiff over abortion-related provisions, but that near miss would be the reason for any optimism about a bipartisan deal on the divisive health care law. Then again Senate Republicans might have no interest in an Obamacare compromise after gaining some seats. Democrats would still likely work on stabilization to send a message to voters on health care ahead of the 2020 campaign. Shoring up Obamacare is a good start, but what next? In the case, the Pallone-Neal-Scott bill might be a nice starting point — no Democrat really disagrees about whether they should help the law work better in the short term — but it still lacks any truly ambitious provisions. It is just about as narrowly tailored as an Obamacare stabilization bill offered by Democrats could be, a fact that aides and activists will privately concede. Missing are any of the bolder policy proposals animating the left. Not even a hint of Medicare-for-all single-payer health care, which is or isn’t a surprise, depending on how you look at it. Medicare-for-all is quickly becoming orthodoxy among many in the party’s progressive grassroots, and a single-payer bill proposed this Congress in the House (similar to the one offered by Bernie Sanders over in the Senate) has 123 sponsors. But House Democratic leaders probably don’t want to take up such a potentially explosive issue too soon after finally clawing back a modicum of power in Trump’s Washington. Still, the current stabilization bill doesn’t even include a Medicare or Medicaid buy-in, the rebranded public option that never made it into Obamacare but would allow Americans to voluntarily join one of the major government insurance programs. It is an idea that even the more moderate Democratic members tend to support, and polls have found three-fourths of Americans think a Medicare buy-in is a good idea. The plain truth is House Democrats haven’t reached a consensus yet about what they want to do to cover more Americans. They agree Obamacare was an important first step, and they agree the status quo is unacceptable. But the exact mechanism for achieving those goals — single-payer, a robust public option, or simply a buffed-up version of Obamacare — is still very much up for debate. That is all well and good, but few issues are exciting the Democratic grassroots right now like Medicare-for-all. During the midterm campaigns, Democratic candidates and even grassroots leaders were happy to let those words mean whatever voters wanted them to mean. For some people, it meant single-payer; for others; it might mean a Medicare buy-in or something more limited. The unreservedly progressive members who were just elected to Congress will only wait so long before they start pressing Democratic leaders to take more aggressive steps to pick up one of their top campaign issues. That pressure will only intensify as the 2020 presidential campaign heats up and Democrats debate what kind of platform they should run on as they seek to take back the White House. For now, Democrats have tried to put off a difficult debate and focus on what unites them. But the debate is still coming. Even with Obamacare and preexisting conditions mobilizing Democratic voters this year, prescription drug prices remain a top concern for many Americans. That’s another area where Democrats know they want to act but don’t know yet exactly what they can or should do. The issue could be an opening for serious dealmaking: Trump himself has attacked big pharma since his presidential campaign. His administration has actually launched some interesting initiatives to rein in drug costs — approving a record number of generic drugs, trying to even the playing field between America and foreign countries — that have some policy wonks intrigued, even if the impact is still to be determined. Democrats have mostly stuck to slamming Trump for feigning to act on drug prices while cozying up to the drug industry. But it’s a top priority for both parties, and there could be some room for compromise. One progressive policy wonk thought a drug prices bill might actually be the first Democratic priority. It helps that drug prices are a populist issue that the new House majority might really be able to pass a bill on. But first, Democrats have to figure out what exactly they are for — and what would actually make a difference. The rallying cry for Democrats on drug prices has been letting Medicare directly negotiate prices with drug manufacturers, a proposal that Trump also embraced as a candidate, though he has since softened as president. The problem is the Congressional Budget Office doesn’t think Medicare negotiations would save any money unless the government is willing to deny seniors coverage for certain medications. But adding such a provision would surely invite attacks that Democrats are depriving people’s grandparents of the medications they need. There are a lot of levers to pull to try to reduce drug prices: the patent protections that pharma companies receive for new drugs, the mandated discounts when the government buys drugs for Medicare and Medicaid, existing hurdles to getting generic drugs approved, the tax treatment of drug research and development. Pharmacy benefits managers, the mysterious middlemen between health insurers and drugmakers, are viewed skeptically by lawmakers and the public. But none of those are silver bullets to lower prices, and they will certainly invite pushback from the politically potent pharmaceutical lobby, focused on the concerns about how much cracking down on drug companies to discourage them from developing new drugs. Democrats also don’t know yet what specific policies could win support from Senate Republicans or the Trump White House. “How do you take this gargantuan Chinese menu of things and figure out how things fit together in a way that stem some of the abuses?” is how one Democratic aide summarized the dilemma. It is a problem bedeviling Democrats on more than just drug prices. Health care was a winner on election night this year, and it has always been a priority for Democrats. Now they just need to figure out what to do.